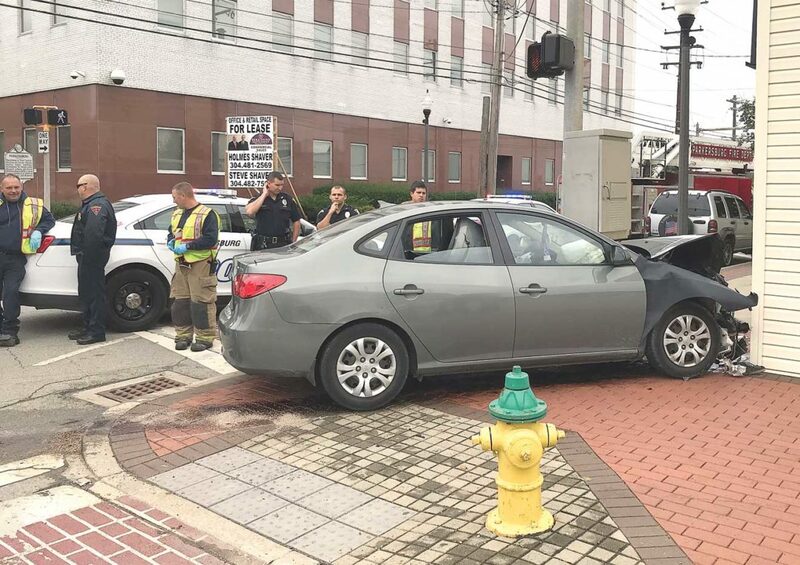 Photo by Paul Lapann Three people were injured in a two-vehicle accident Sunday afternoon at Fifth and Juliana streets in Parkersburg. PARKERSBURG — Three people were injured in a two-vehicle accident at 1:15 p.m. Sunday in downtown Parkersburg. Sgt. B.J. Depue with the Parkersburg Police Department said Robert Behnke, 38, of Parkersburg, was northbound on Juliana Street with a green light when Lucy Stephens, 62, of Belpre, ran a red light at Fifth Street and struck his vehicle. Stephen’s vehicle then struck the My Way Lounge, causing minor property damage, Depue said. Lucy Stephens and one passenger, Irene Stephens, 36, no address available, were transported to Belpre Campus of Memorial Health System, treated and released. Her other passenger, Britny Bell, 28, no address available, was transported to Camden Clark Medical Center. Depue said all three had non-life threatening injuries. Hospital officials reported all three were treated and released. No citations were issued, Depue said.